NASA's Spirit Mars rover landed on the Red Planet on Jan. 3, 2004, and operated for more than six Earth years. 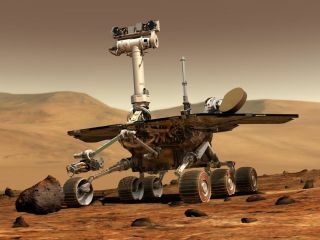 NASA's epic and ongoing Mars Exploration Rover (MER) mission began its Red Planet operations 13 years ago today (Jan. 3), with the touchdown of a six-wheeled robot named Spirit. Spirit landed on the night of Jan. 3, 2004, and its twin, Opportunity, followed three weeks later. The two MER rovers were tasked with hunting for signs of past water activity near their touchdown sites, which were in very different parts of the Red Planet. Spirit's last communication came down to Earth in March 2010, and MER mission team members declared the rover dead a year later. In the end, Spirit put a total of 4.8 miles (7.73 kilometers) on its odometer. Spirit made many important discoveries during its six years of work on Mars. Perhaps the most exciting came when the rover's crippled right-front wheel dug a trench in the dirt of Gusev Crater, revealing bright-white silica. On Earth, such deposits are created by hot water reacting with rock, so Spirit likely uncovered an ancient Martian hydrothermal system, NASA officials have said. The find strongly suggested that, long ago, at least some parts of Mars harbored liquid water and an energy source — two key ingredients necessary for life as we know it. Spirit found other evidence that liquid water flowed across Mars in the past (as did Opportunity). The rover also photographed dust devils and Martian clouds, and it captured the first image of Earth ever taken from the surface of another planet. Spirit's death didn't mark the end of the $800 million MER mission. Opportunity remains active to this day, and, an arthritic robotic arm and some issues with its flash memory notwithstanding, it's quite healthy, MER team members have said. Opportunity has made a number of important discoveries of its own. And the rover also holds the record for the longest distance that has been traveled on the surface of another planet — 27.12 miles (43.65 km) and counting. That's longer than a marathon, which covers 26.2 miles (42.2 km).